Web | Mobile Apps Dev. The Holidays start with a bang when these musical fireworks light up the sky over the the Old Port. 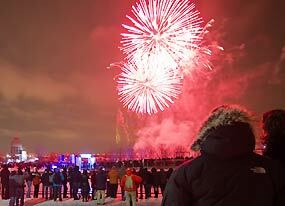 Magical, spectacular fireworks -a unique, innovative show every time- burst over the St. Lawrence to create a thoroughly original urban winter experience. AppDoozy is a Web Design and Mobile App Development firm. We build “Responsive” websites and Mobile Ready Apps for Apple and Android. We are fully licensed to Publish your App in the Apple, and Android/Google marketplace. MtlChic specializes in Advertising, Publishing, Marketing and Consulting. We have worked with numerous well known companies in Montreal. help your business grow successfully.